Duncan Jones directed one of my favorite movies of recent years: “Moon” which stars Sam Rockwell. If you’ve never seen it, “Moon” is well worth checking out. It’s the best Stanley Kubrick movie Stanley Kubrick never made. 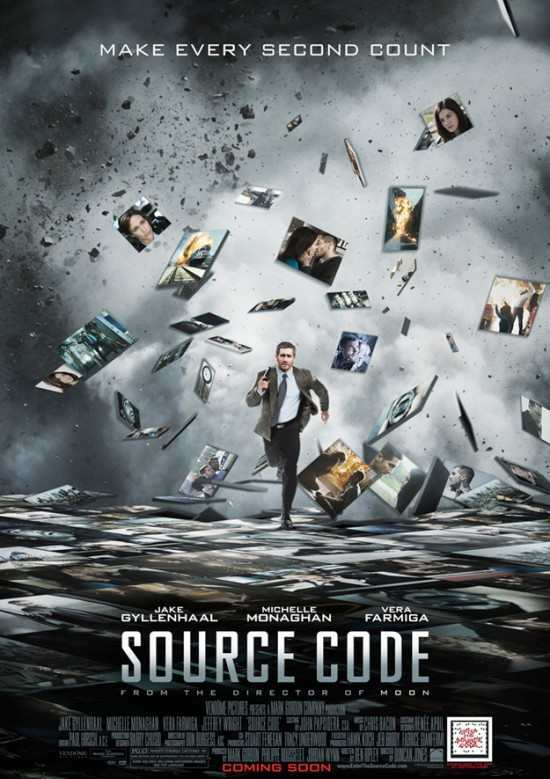 So I was highly intrigued to see SOURCE CODE. Unfortunately it didn’t come anywhere near engaging me as much as “Moon” and after about 45 minutes I was actually bored with the movie. Colter Stevens (Jake Gyllenhaal) wakes up on a Chicago bound train with no idea of how he got there or why the beautiful young woman sitting across from him (Michelle Monaghan) insists on calling him Sean. Her name is Christina and it’s obvious from the way she talks that she knows Sean well. Colter is totally gobsmacked. The ID in his wallet isn’t his. It belongs to Sean Fentress, a schoolteacher. Colter is even more astonished when he goes to the bathroom and the face in the mirror isn’t his. Colter returns to Christina to demand answers but before he can get them, the train explodes. Colter doesn’t die. Instead he wakes up again. This time inside of a metal capsule where he is being questioned via computer screen by Captain Goodwin (Vera Farmiga) who frustrates Colter to no end with her stubborn refusal to explain where Colter is and how he got there. You see, he remembers flying a helicopter gunship in Afghanistan. And now he’s here. And ‘here’ is The Source Code. As Captain Goodwin explains, Source Code is a top secret military funded and operated time travel method by which Colter can inhabit someone else’s body in the past for exactly eight minutes. And the body Colter inhabited died on that train which was blown up in a terrorist attack. It’s vitally important that Colter find out who planted the bomb in order to prevent another, even more devastating bomb attack later on that same day. This entails sending Colter back again and again and again to relive the last eight minutes of Sean’s life. Every time he does so, Colter puts together even more of the puzzle. He also falls more and more in love with Christina. Which doesn’t sit well with Dr. Rutledge (Jeffrey Wright) the creator of Source Code. Right from the beginning Colter doesn’t trust either Dr. Rutledge or Captain Goodwin. Both of them stubbornly refuse to explain anything other than he has to find the bomb and the bomber. They won’t tell him how he got there. Colter isn’t even sure this is all real since every time he returns to the capsule, the interior is different. One time there’s ice inside of it. Another time it changes shape right before his eyes. He highly suspects it’s a training exercise, a virtual simulation. But what if it isn’t? Now I know this sounds terribly exciting but for me it wasn’t. SOURCE CODE played out for me as a mash-up of “Groundhog Day” and “Quantum Leap.” And I don’t think that was lost on the filmmakers as well since Scott Bakula provides the voice of Colter’s dad who we never see but is heard in a couple of emotional scenes. The movie quickly settles down into a set series of events: Colter goes back in time. He learns a little bit more about the bomb/bomber. He has a few heartfelt longing looks with Christina and soulful dialog. Train blows up. He’s back in the capsule. He argues with Captain Goodwin. She sends him back to the train. Wash, rinse, repeat. Jake Gyllenhaal isn’t bad, though. Between this and the awful “Prince of Persia” I can see where he has the makings of an action hero. He just hasn’t found the right material yet. And SOURCE CODE does raise some intriguing notions about time travel including my favorite: that Colter actually isn’t going to the past. He’s going to alternate Earths instead, since he’s creating new timelines that diverge from his taking over Sean’s body and attempting to change what has already happened. Cool stuff, really. I just wish it had entertained me more. I do give SOURCE CODE props for being an actual science fiction film and not just a horror or action movie in sci-fi drag. Still, I recommend giving this a viewing on a slow weekend if you really can’t find anything else that grabs your attention.